Conflict and economic stagnation have made displacement, family separation, and economic hardship a daily reality for too many people in Iraq. More than 3 million Iraqis have been displaced since the beginning of the conflict in 2014, and around 11 million people need humanitarian assistance. Throughout 2017, the Iraqi Red Crescent Society, supported by the National Red Cross Societies of France, Sweden, Norway, Denmark, and Finland, has been offering lifesaving services to ease the burdens of around 800,000 internally displaced people (IDPs) in and around the city of Mosul. Red Cross Red Crescent partners have been promoting hygiene and providing access to clean water and sanitation, non-food items, and health services including mobile clinics and psychosocial support. Awareness has also been raised about the International Red Cross Red Crescent Movement’s Fundamental Principles and International Humanitarian Law, especially among local young people. Intisar al-Kareem comforts her crying baby. 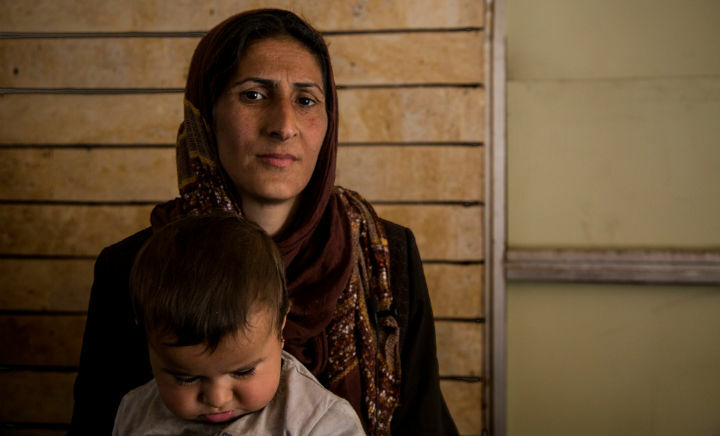 She remembers the horrors they left behind in ISIS controlled West Mosul. Now, she is worried about the future. “We can talk about everything here,” says Intisar. It’s twilight, and about twenty women are sitting in the side room of the mosque in East Mosul’s al-Barak neighbourhood for a gathering of the psychosocial support group organised by the Iraqi Red Crescent Society. The other women in the group know the hardship she has been through. They have all survived horrific and uncertain circumstances. Now they live as refugees on the other side of their own city, worrying about food, shelter, and clean water. Meanwhile, children are playing outside with psychosocial support volunteer and social worker, Azad Suleiman. They have experienced extensive trauma, with even the very young describing how they saw their father or brother being killed. But when they are playing, they look like children anywhere. 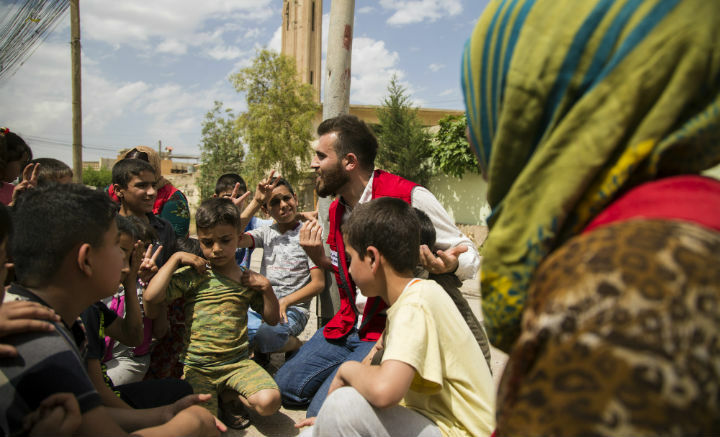 Rashuan Sheikhan is responsible for disaster relief operations in the Iraqi Red Crescent Society’s Erbil branch, and is familiar with the difficulties of working in a region affected by human conflict. A lot of arrangements must be made and paperwork completed before the trucks delivering aid can move. “Internally displaced people are in a very bad situation and need all possible help. Sometimes I come home crying, because there has been so much suffering in Mosul. People do not have money for medicine and there are no jobs. They depend on aid organisations,” says Adra Hashim from the Iraqi Red Crescent Society. Adra carries plastic boxes to the truck, each one containing kitchen utensils for six people, jerry cans, plastic sheeting, torches, and hygiene kits. These kinds of non-food kits have been delivered to 7,000 households. Warehouses are essential for storing supplies, but some had fallen into disrepair, with leaking rooves and broken doors compromising the condition of the goods being kept. 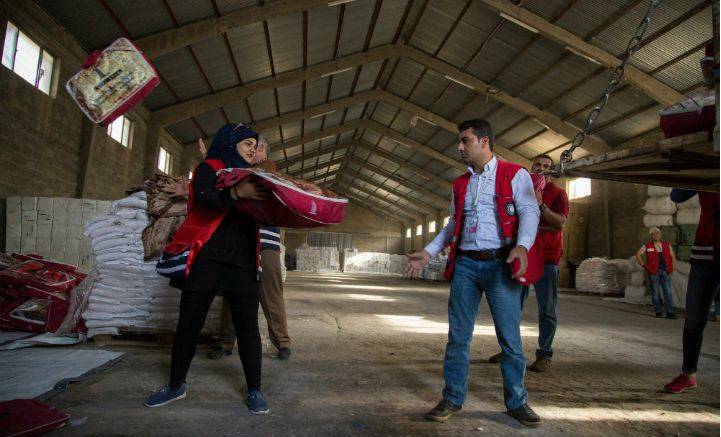 Two Iraqi Red Crescent Society warehouses have now been rehabilitated and put to use. 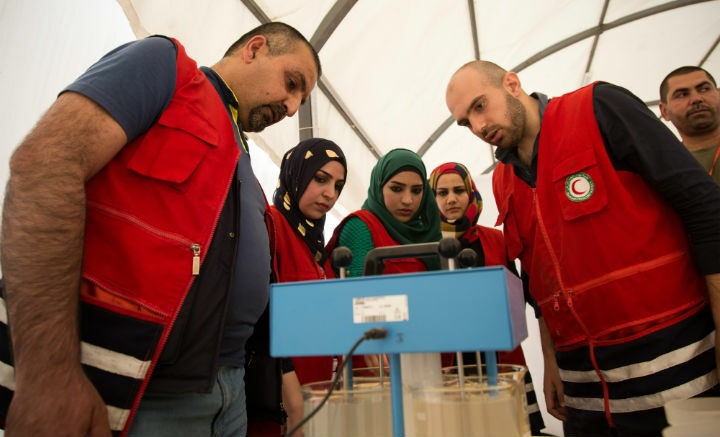 Iraqi Red Crescent Society volunteers from East Mosul are doing a course on how to set up and operate water treatment units, to provide water for the people who have been displaced. The units work by taking water from a river, lake, well, or almost any other source, and pumping it through a system of filters to give out clean water. There are three units being set up, each designed to provide 5,000 individuals with 20 litres of water respectively, every day. Between April and October 2017, drinking water was delivered to 42,000 people in two hospitals, a school, and more widely across West Mosul. The project is funded by the European Commission Directorate General for European Civil Protection and Humanitarian Aid (ECHO) and is set to continue until the end of 2017. “There are many challenges in providing aid. But the fight to be able to help those most in need is worth fighting,” underlines Javier Rio Navarro of ECHO, who oversees European Union aid programmes in Iraq.